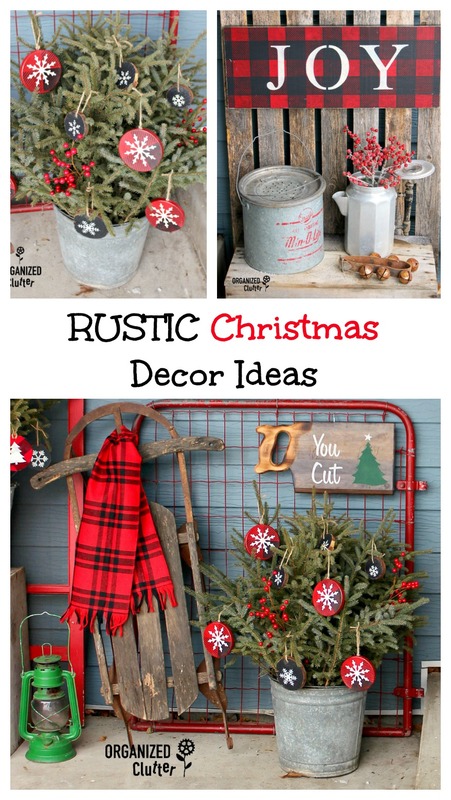 Today I'm sharing my junky rustic Christmas outdoor patio decor for 2018! It's like junk gardening, only it's winter, so there are no flowers! But, I get to put together a few vignettes with my favorite junk. 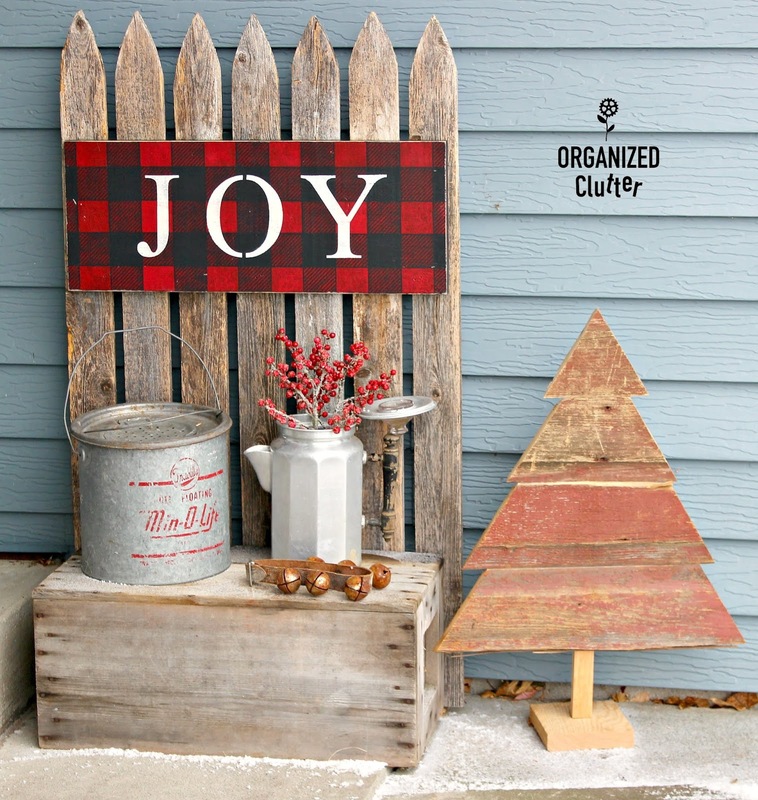 Do you remember this weathered picket fence section that was attached to an old crate? 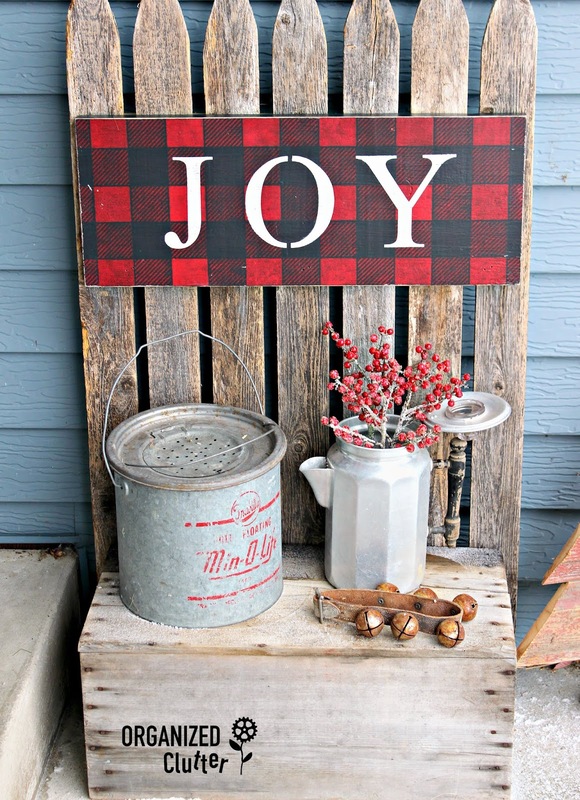 If not, you can see this rustic display piece as a floral display piece HERE. The buffalo check "Joy" sign is a project from last Christmas. See the details HERE. 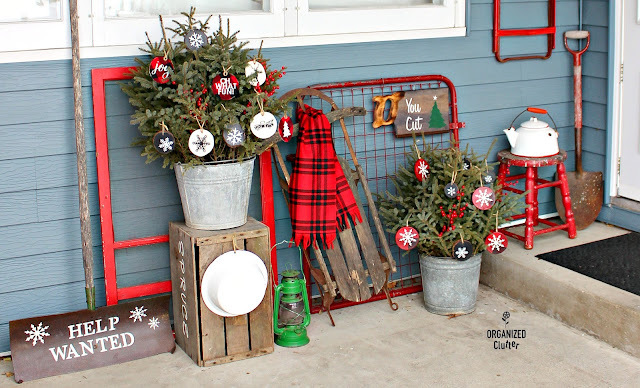 I didn't make the barn wood tree! 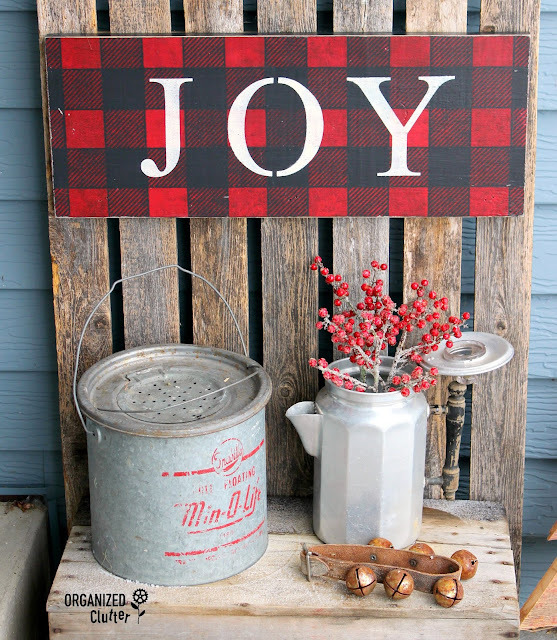 I purchased it on Small Business Saturday at Little Sister's Antiques in Cold Springs, Minnesota. It's a really fun place to visit and shop. I added four faux red, icy, berry picks to an old coffeepot, and arranged it on top of the crate along with a vintage minnow bucket and a rusty bell collar. Of course, I have a few galvanized buckets of spruce tips again this year. I did not add any red dogwood twigs or birch branches this year. I decorated the spruce tips with ornaments I crafted, and a couple of red berry picks. 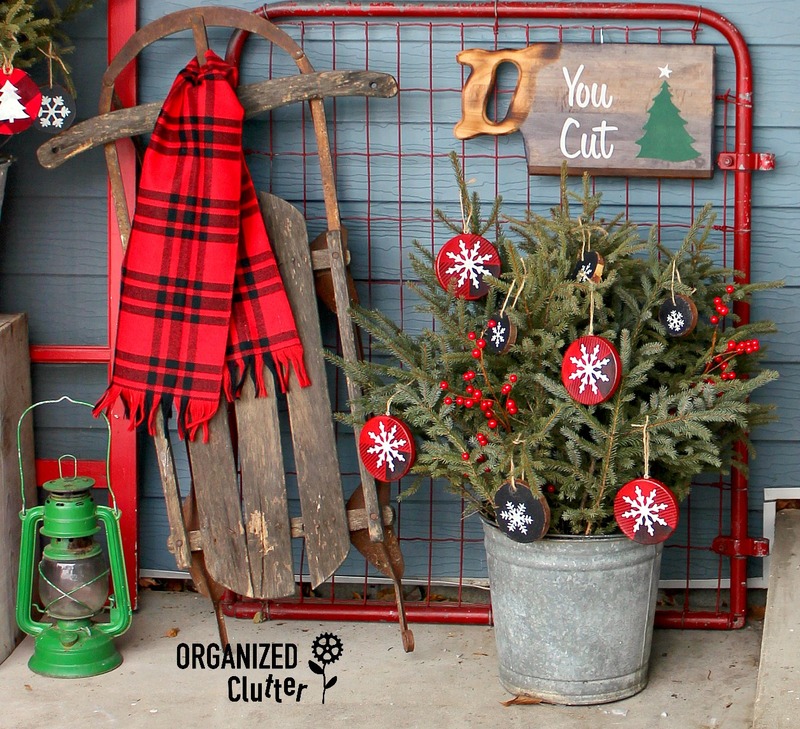 The red and black buffalo check ornaments with a snowflake, started out as round, plain, brown paper ornaments from Hobby Lobby. I purchased them at 50% off. See the details on these ornaments HERE. The wood slice ornaments on my spruce tips were painted and stenciled from blank wood slices from Hobby Lobby. The regular price was $2.99. Of course I got them for 50% off. 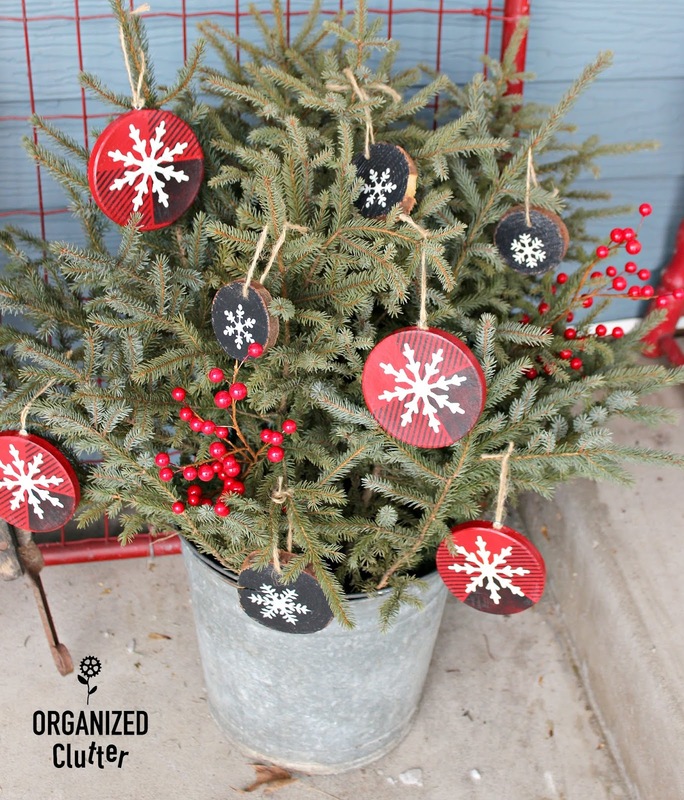 I simply painted the top with black paint, stenciled on a snowflake from a Hobby Lobby Christmas Craft snowflake stencil with white craft paint, drilled a hole in the top for a jute string holder, and sealed the paint and stencils with water based poly. 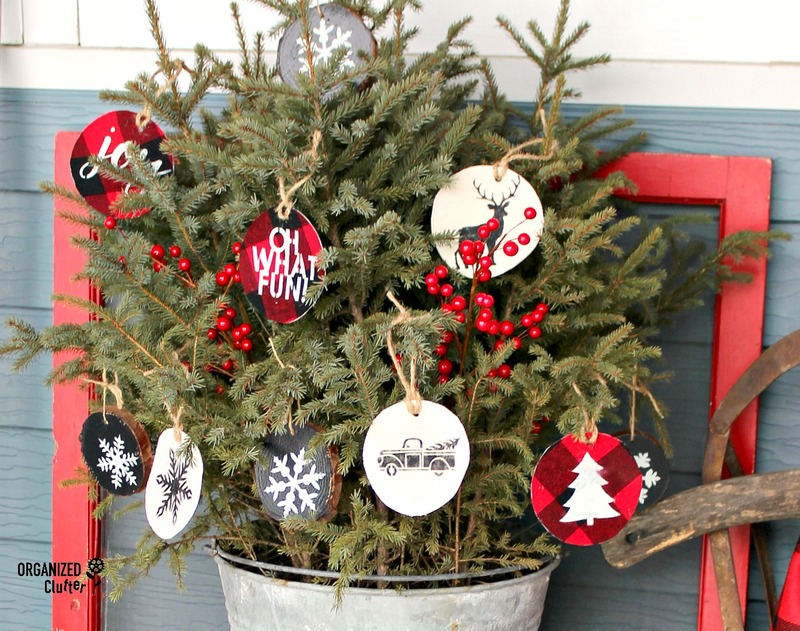 The other spruce tip bucket is decorated with more of the wood slice ornaments and fabric ornaments created with fabric and stencils from Joann Fabrics. Details on these easy ornaments are HERE. The chippy red, metal gate is new for this season. I found it last month at a local antique shop. I think I paid $18 for it. 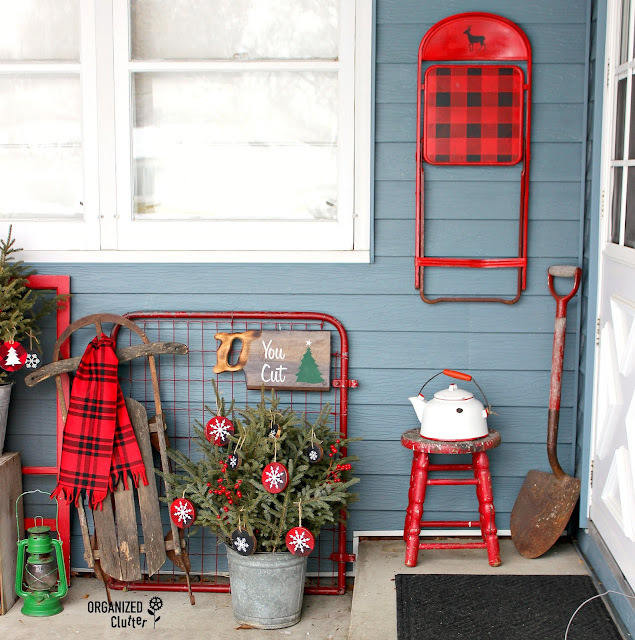 The old sled with a broken runner, the plaid scarf and the green lantern are all inexpensive and fun finds from my storage. 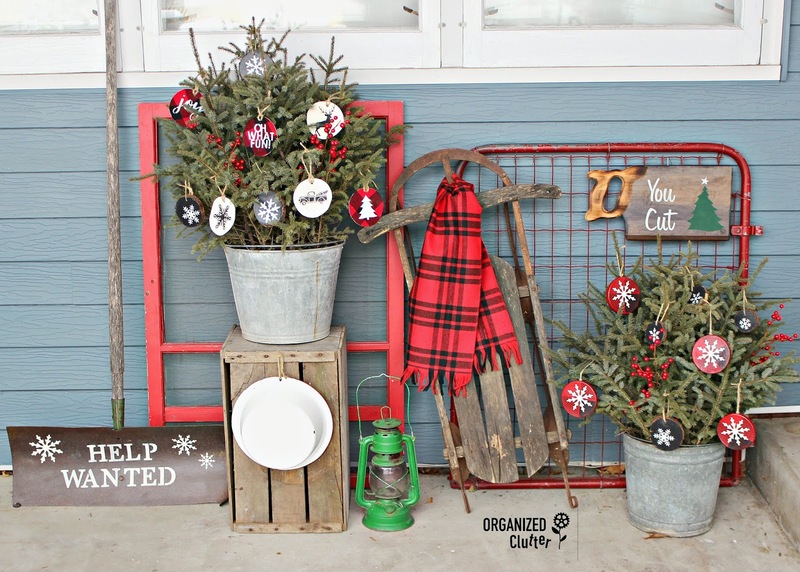 The sign is a Goodwill cutting board that I transformed into a tree farm sign. See the details on that project HERE. 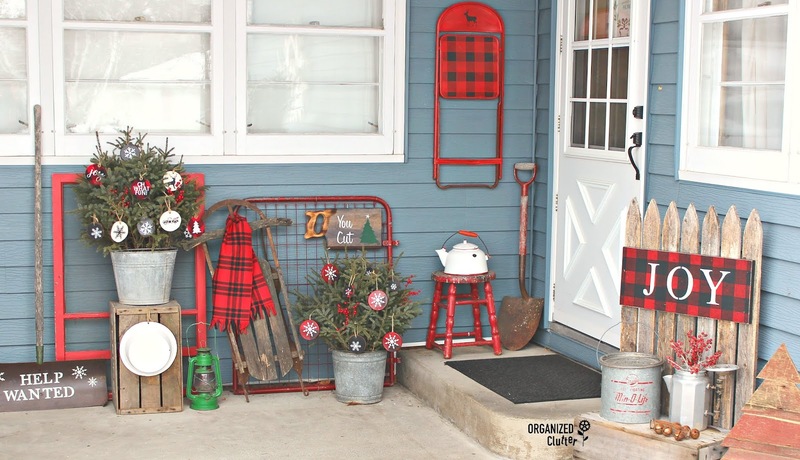 To the far right, on the cement step, I have placed a very chippy red, wooden stool, a red and white enamelware tea kettle, a red handled vintage shovel, AND, my very sweet buffalo checked metal, child's folding chair from last Christmas, is hanging above. The details for the chair project are HERE. Finally, at the far left is my vintage snow shovel sign project, a red window screen as a backdrop, an old crate, an enamelware bowl and the other rustic spruce tip bucket. This is why I named my blog "Organized Clutter"! Crazy clutter that I love to organize as vignettes, inside and outside. Thank you for visiting my Christmas covered patio! Your patio looks great! 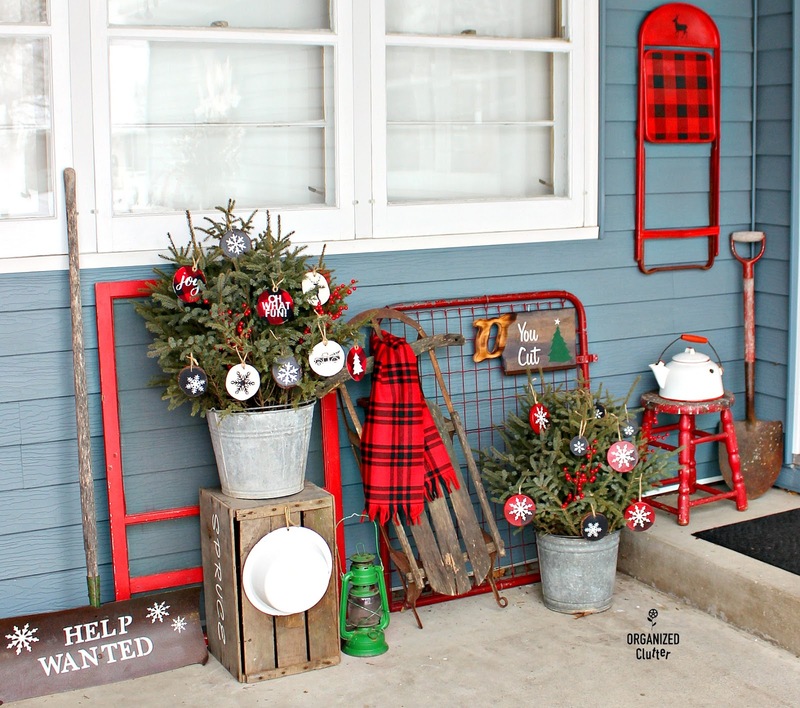 I love that sled with the scarf hanging on it and the red gate is a fantastic find. Love that chair you've got hanging on the wall. You are definitely looking like Christmas - green lantern adds a special touch!